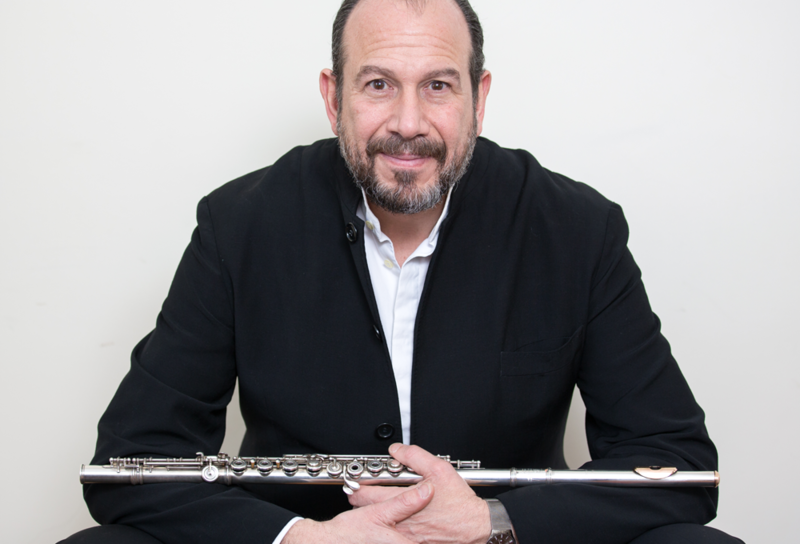 I heard Wissam Boustany speak about the Method Called Love at the 2015 National Flute Association Annual Convention. During that time, I was recovering from severe burnout. Wissam’s workshop gave me the courage to open my mind to new possibilities. Wissam: It’s a journey, in a way. The journey from being a student to taking control and becoming a fully empowered self-motivated player. My personal journey involved the rejection of many ideas I had learnt as a student, followed by the reconciliation of those ideas. I try to go into the heart of why I play the flute and how I play the flute, and how the flute relates to the wider world. This extends to when I was a student as well as in the institutions where I’ve taught. Once you are in an institution, you are in a kind of bubble, which can get a bit frustrating because we stop seeing the wider picture. We start to analyze music in a small way, too academically or too technically. The challenge is basically to reconcile my heart with my body and to find the burning reason why I play the instrument. As a teacher, I’m much more interested in waking my students up than defining their actual journey. So, rather than telling them, “Okay, you’ve got a problem with articulation here” and trying to describe things in physical terms, I prefer to ask what it it that they are looking for, and what it is in our attitude that we can change, so we can make friends with the issue and heal it. This is why I call my search “A Method Called Love.“ I try to let go of previous approaches that are predominantly based on books, studies and exercises conceived by other people — and substitute these with my own thought processes and sensuality. I use my love for music to ignite a very personal approach to moving forward with music. I try to avoid putting things in boxes and creating standardized approaches. If ten thousand people are using the same exercise to control how they make a sound, if they are playing the same notes, then surely there is a danger that people start to sound the same. Individualism somehow gets lost in all that….and the deeply personal voice of an individual is one of the most fundamental ingredients of music making, I would have thought. I think it’s far more important to ‘search’ than it is to ‘be right’. Actually, the tension and resolution in music lies in the search, before the arrival of gratification. I love the tension between ability and want…that is where music comes alive. Quite often, with people who have really sorted out their technique to such an extent that they don’t struggle anymore, a kind of laziness creeps into the playing which impresses, but doesn’t inspire. I search for whatever makes the heart wakes up. Quite often, my heart only wakes up outside the realm of music. I search in human issues, in the state of the world, and also, in this smallest physical movement (fingers, lips, posture). You learn to love the reasons why things relate to each other. You construct your own narrative around something that you want to approach in a certain way, and you make it your own. That is basically my method called love. I base my whole practice/performance/teaching on that and it also influences the way I deal with people and map out proposals. It’s like a light that you can shine on any issue in life. You bring to that issue your highest state of consciousness into play. I think with that concentration, so many doors open – in concerts, in practice, in the way you analyze things. It’s a light that I shine on anything that I don’t quite understand. That is a method called love. Amanda: So the method is not just for flute – it’s a way of living. Wissam: Yes—our instrument often limits us. When we remove the instrument, it allows us to fly as a person. When you fly as a person, you are also able to reach to fantastic places as a flute player. What is life without music? What is life without love? Without love there is no real reason to continue living. Look at the state of the world, especially now. Growing up in Lebanon, the war there…. that affected me very strongly. It never really left me, although I left both Lebanon and the war. I am very conscious of the state of the world in terms of peace and war and the issues surrounding the way we live as human beings. I can’t get away from that, nor can I separate my music from it. I have to understand my pain, then use my music as a vehicle to make our world a slightly better place. I want to bring something to the table that hasn’t been compromised by the world we live in. This feeling reaches into my charity work because when I give something beyond the music, I feel my music has grown. I have often worried that I may sometimes play for selfish reasons so that I can ‘feel that my life is worth something’, but that is something that I have learned to just accept. I love it when I play a phrase and know that that phrase has facilitated a better life for a blind person in a school that has been able to buy a braille software for their computers. That’s a direct result of music. It’s not just about a beautiful flute, it’s about beautiful sounds making the real world we live in better. That is a very, very strong motivation to keep going… to keep questioning and to keep the fire alive in my heart. When the fire isn’t alive, I’m really unhappy and it shows in my playing. I can feel it immediately. I don’t ever want to compromise on that. Amanda: I’ve heard you speak, especially when referencing the method called Love, about redefining common words we use as musicians – such as technique, for example. Could you speak on that? Wissam: At one point, there was a big conflict between music and technique for me. I realized that there was a problem with the word “technique”, in my mind; I always reacted very negatively to the word. It’s one of those tired, cliché words that is often misunderstood because we see it through a filter of personal insecurities. The word brings about all kinds of negative views and attitudes, before I’ve even blown a note. I realized this years ago, so I decided to redefine what technique meant to me in order to be able to move forward and stop the constant internal war. So, I came up with a very clear definition over 20 years ago that I still believe in today: What is a technique? Technique is the ability to play in an inspiring way – consistently. I decided that I had to do whatever allows me to play in an inspired way consistently…whatever that is, is what defines technique for me. It’s rather broad. It’s not fingers, diaphragm, or not having to do with the body, but an attitude and an approach to life. So, whatever it takes for you to play in an inspired way. I realized that when I am in a state of love, when I am aroused emotionally, that’s when I can give my best effort. There is a direct connection between what we feel and how the body reacts. Instead of denying our body and treating it like a machine by controlling it in a muscular way, why don’t we bring out the emotion and let that emotion translate into physical reality? That is a method called love…the marriage between the internal and the external, that is all part of who we all are. Amanda: So, seeking what inspires you? Wissam: You have to redefine things and find your own words instead of your teacher’s words. There is a lot of tradition that is thrown at us. People love to say “I studied with Moyse and Moyse studied with Gaubert,” etc., as though they had a direct lineage to Truth…It’s a bit like going back to religious scriptures for self-validation. Why does validation always have to come from an outside source, preferably a few hundred years back, for an idea to be respected? Why do geniuses have to be dead before their ideas are accepted? In institutional learning, footnotes are valued much more than the message idea itself. They value an idea more, if it comes from an outside source, than if was born out of a person’s instinctive passion. This thinking denies the fact that wisdom coming from experience, will always go far deeper than anything one reads from a book. Knowledge is often used as a form of intellectual bullying, to put others down. The person, who knows the most facts and is able to call them at the right time, wins the argument. This counts for a lot in academic circles but also in political circles. For instance, why do you not kill someone? Is it because the law says it? Or because the Bible says it? Or, is it because you can’t imagine taking someone else’s life away and is a deeply felt instinct? It is not something that you have to read somewhere. These morals do not need to be owned by certain politics or religions. I think it’s the same thing when it comes to talking about musicality and style. We make many musical decisions that are instinctive and often we don’t have the historical context. It’s good to have some historical context, but beauty, love and authenticity have an aesthetic that often rise above historical context. If my love for the music pushes me to find out something specific that will help me love it more, fine, but it must always be driven by that love. We should do something because we want to, not because we have to. Whether you play an instrument with two keys, seven keys or even ten keys… whether it’s made out of wood, gold or silver…these are not the fundamental questions. There’s so much that we are never going to know…and yet, we are uncomfortable about trusting our instincts. When you think about the act of performing, it’s a very direct emotional transaction. We connect with an audience on an emotional level. We play a phrase, in whatever way we truly believe in. If there are 200 people in the audience, there will be 200 different ways of receiving that energy! Music facilitates an open environment that speaks to people’s hearts in a very direct way. I believe this is very important to remember when learning the art of performance. If we do not understand this, our minds are filtered and imprisoned. Amanda: Do you have any suggestions for performers or teachers to be more mindful? Wissam: I would never presume to tell anyone how to teach or perform. But, I believe that two things should not be compromised in either: memory and improvisation. Memory slows down the learning process, allowing us to physically “catch up” with our minds; the physical and mental needs are reconciled with each other. Playing from memory often heals my tension issues. Even Alexander Technique or Feldenkrais will not benefit me if I do not actually know where the music is going. If you are constantly caught out of balance by not knowing the piece well enough, you are going to be tight. The opposite side of the spectrum of memory is improvisation. While improvising we strive to make everything sound beautiful and convincing, all while staying in control physically. Accidents can become revelations. Also, that means that when you are in trouble while playing from memory, you can improvise your way out and not completely collapse. For me, memory and improvisation are the two legs I stand on as a musician. So I simplified the way I practice. I came to the conclusion that, since every piece under the sun is built from scales and arpeggios, I play scales all the time and therefore do not have to practice them separately. That’s like telling someone who walks in a forest every day to substitute that with running on a treadmill…Of course, walking in the forest is going to be much healthier!! For me, music is my emotional forest…it’s where all the beauty and poetry are to be found. The musical forest allows you to be in touch with a musicality that is in a state of perpetual motion and evolution. Patterns that repeat themselves in a similar way too often dry up. Practicing, for me, involves the search for improvisation and memory. Improvisation and memorization are not as far from each other as you might think. If you are improvising, one of the most important things to do is to listen. If someone plays something that you like, you take those notes and start to play games with them. In order for improvisation to develop, memory has to be present; otherwise, you are inventing everything completely new…something which becomes unsustainable. Even in improvisation, you are relying on very quick memory to save you! Equally, when you are playing from memory but are not quite sure what you are playing, your inner ear saves you because you know the tune in your head without knowing the notes. So, there are relationships that you can learn to love and encourage to merge. Once you have tasted the freedom and liberation that improvisation facilitates, it is very difficult to put that genie back into the bottle! There are some negatives involved in memorization, however: when you repeat something too often, it can go stale on you. We need to be aware of this and avoid excessive repetition. You need to learn to love spontaneity and do whatever it takes to enhance it. Again, I always come back to the word love. It’s like a door that you open, a light that you shine on something that seems opaque. Once you shine that energy on the unknown, you start to understand its nature and learn to love it. It becomes your friend. Most of what we do as flute players is about very gently changing our attitudes towards the things that seem to be limiting us. I find that an absolutely thrilling process. And when I witness it in other people, it reminds me of what I can do. Whether it’s a teacher or a student, when you see it in others, it reminds you of the processes that you are wanting to allow to happen. Amanda: How do we keep our composure as teachers, musicians, and artists in the 21st century? I think a lot of us recognize that there is a shift in society, especially from technology and the internet. Wissam: That is so important. I 100% agree with you. When you say 21st century as opposed to 20th or 19th century, those concepts don’t compute in my mind. Every time has its brilliance and its limitations, including now. Time is one of the big issues that we deal with as musicians. I know this is not exactly what we are talking about but it is, in a way, related to that. I don’t believe in human time, but rather in a kind of cosmic time. When a moment becomes frozen forever, it’s not just a moment. I don’t believe in metronomes. Watches are useful for not missing your plane but the concept of compartmentalizing time into that kind of unit is totally against the concept of music and real time in nature. I think most of our lives, we live completely of touch with real time. Within time, there is so much flexibility if we allow ourselves to love that aspect of time. Sometimes we feel we have no time at all…that becomes our reality. And sometimes we feel we have all the time in the world…and that’s our reality too. It’s a decision we make. It’s not imposed on us. Going back to your technology question—I think it’s best to acknowledge the limitations of the internet, while simultaneously taking advantage of its potential. It is our reality in today’s society. We are missing all that online! We have access to everything but we don’t have a true immersion, physically speaking, in anything. We wonder why there is so much loneliness and frustration around these days? I’m resolved to go to many more concerts this year. Even if it takes me away from my own work, especially now that I am breaking into conducting. Amanda: There is something magical about live performances. I recently took a group of fourth graders to a symphony concert. For many of them, it was their first time to see and hear a symphony. During the performance their eyes were open and their jaws were dropped. Wow! There was so much movement in front of them. Several commented they could feel the vibrations from the instruments…You can feel it on your skin, and it’s so different from popping in a CD. Wissam: Also, the volume of the symphony orchestra. You can get more volume out of a rock group playing, but the volume produced is from loud speakers that require little physical effort from the players. The volume of a symphony orchestra playing unamplified might not have the loud volume but way more power. It projects a raw kind of emotion! The only guitarist who got the balance right with speakers was Jimmy Hendrix. Many guitarists equate volume with the push of a button. Can I tell you something that happened to me once I was at a lunch time radio recital in Rochester many years ago, maybe 15, 20 years ago? a little girl stood up and started to dance with the music! Her teacher stood up and hit her on the shoulder, told her “Sit down!”…I felt bad on her behalf because she had done absolutely nothing wrong; she had simply responded spontaneously to the music! A few seconds later, while I was playing, I managed to catch her eye and I winked at her…and at point I lost my concentration and made a silly little mistake – but that was a BEAUTIFUL moment of sharing that I will never forget! 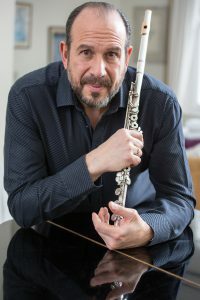 Wissam Boustany’s passionate musicality has helped him forge a unique reputation as an international flute soloist. His charismatic stage presence brings tremendous power and subtlety to a wide range of musical genres ranging from baroque, classical, romantic, contemporary and jazz settings. Imaginative programming often mixes the innovative with the traditional, captivating audiences with an engaging style that combines an improvisatory flair with a wide emotional and expressive range, and an acute sense of tone color and nuance. Wissam has developed a unique duo partnership with pianist Aleksander Szram. In 2015, they toured in Australia, Canada, USA, Holland, and Norway, leaving audiences consistently overwhelmed by the way they both perform from memory, bringing a completely heightened experience and intensity into their adventurous music-making. Wissam regularly performs and teaches in a variety of contexts, facilitating the growth of young talent. He has created his own teaching method titled “A Method Called Love”, which has spread internationally, focusing on improvisation, memory, self-reliance and the development of the concept of Love as a powerful motivator, facilitator and teacher. He has been a long-standing flute professor at Trinity Laban, London, and the Royal Northern College of Music, Manchester. More recently, Wissam has ventured into composing. Audiences around the world have responded enthusiastically to the transparent textures he weaves into a profoundly instinctive Middle Eastern tonality. His two recent works “And the Wind Whispered” and “Broken Child” are available through Tetractys Publishing. He has performed with some of the world’s leading conductors including Claudio Abbado, Ivan Fischer, Bramwell Tovey, John Elliot Gardiner, Roger Norrington, George Solti, Peter Szilvay, Lubnan Baalbaki, James Judd, Jordi Mora, Volodymyr Sirenko, Levon Parikian, Nicholas Cleobury, Martyn Brabbins, Varujan Kodjan, Clark Rundell, Jerzy Maksymiuk and Ludwig Carrasco. Prestigious orchestras Wissam has worked with include the BBC SSO, BBC Philharmonic, LSCO, State Symphony Orchestra of Ukraine, Utrecht Chamber Orchestra, St Paul’s Sinfonia, Polish Chamber Orchestra, Qatar Philharmonic Orchestra, Cairo Opera Orchestra, Orquesta 5 de mayo, the Chamber Orchestra of Europe, Lebanese Philharmonic Orchestra and Palestine National Orchestra. More recently he collaborated with the Kristiansand Symphony orchestra, as part of a three-year residency at University in Agder, Norway. Collaborations with several composers have resulted in inspired new additions to the flute repertoire by: Bushra el-Turk, Houtaf Khoury, Yevhen Stankovych, Edward Gregson, David Sutton-Anderson, Alun Hoddinott, Tarek Younis, Paul Reade, Peter Cowdrey, Carl Witt, Pierre Thilloy, Paul Renan, Dai Fujikura, Michael Oliva, Beat Furrer, Simon Holt, Boghos Gelalian, Waleed Howrani, Marcel Khalife and Shaun Bracey. Please visit Curriculum Vitae page on Wissam’s website for further details. Six solo CDs are currently available: Wandering Winds, Sounds from Within, Vivaldi’s Children, Mirror of Eternity and This Invisible World on the Nimbus Alliance label, and Edward Gregson’s Concerto Aztec Dances on the Chandos label. Born in Lebanon, Wissam Boustany began his musical studies in Beirut with his stepfather. He moved to Britain in 1977, where he studied at Chetham’s School of Music and the Royal Northern College of Music. During these years Wissam received numerous awards, notably the Silver Medal in the 1982 Madeira International Flute Competition and (in the same year) the woodwind prize in the Royal Overseas League Competition. He was also the Silver Medalist in the Shell/LSO Competition and won the 2nd prize in the woodwind section of the first ‘BBC Young Musician of the Year’. During his early professional career, Wissam was associated with the Chamber Orchestra of Europe in the early 1980s, with whom he appeared as soloist on the award winning Deutsche Grammophon recording of ‘Il Viaggio a Rheims’. In more recent years he has free-lanced with the Philharmonia Orchestra, London Philharmonic Orchestra and Palestine National Orchestra. Wissam’s experiences of the war in Lebanon have greatly influenced his outlook on both Life and Music, crystalizing into a burning intensity, commitment, deep sadness, and spirituality that find their wings in the sound of his flute. In 1995, he founded Towards Humanity, a multi-decade international initiative working with musicians and charities, helping communities who suffer from the tragedies of war. This project was inaugurated in February 1995 at the Royal Albert Hall, London; this was followed in 1997 by a knighthood by the Lebanese government (Chevalier de l’Ordre du Cèdre) in recognition of his music and peace work, and in 1998, he was presented with the Crystal Award at the World Economic Forum in Davos, Switzerland. Wissam plays on a Brannen Kingma-System flute, and a cocus wood headjoint made by Tobias Mancke.